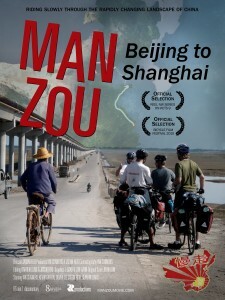 Man Zou: Beijing to Shanghai » Blog Archive » Man Zou…2 years later! Well…It’s been 2 years since we returned from filming Man Zou in China and I thought it would be fun to look back at the experience now that I have finally have some distance from the project. Start to finish, it has taken over 4 years of my life and we are very excited to finally be sharing our adventure with a much larger audience. It’s been a long, arduous process…but I think we came away with a finished documentary that provides a very different look into a country that is too often misunderstood by Western media and people in the United States. Our goals for the film were very simple…To go to China for the first time and bicycle from Beijing to Shanghai 1,000 miles, without the assistance of support vehicles. We went in with open minds and constantly running cameras, in an attempt to capture a more intimate look at China, the people, and the rapidly changing environment in which they live. I have always felt that bicycle touring is the best way to see a country because of the level of access that you get by traveling 3 feet off the ground, at 10-15 mph. We were also lucky enough to have a Chinese guide, Doven Lu, along with us on the journey. In traveling with him and seeing the country at that level, I think that we were able to see China through a lens that not many people have looked through. We always intended for Man Zou to be much more than an adventure film about our travels in China. Instead, we wanted our experience to serve as a vehicle to delve into some of the larger issues that were facing the country following the 2008 Beijing Olympics. In retrospect, I believe we accomplished these goals for the project. In riding through the varied urban and rural areas between Beijing and Shanghai, it opened a window into some of the many contradictions that exist in China today: old vs. new, rich vs. poor, development vs. environment and taking time to see things along the way vs. moving rapidly in modern world. Looking back on what we did, there is little that I would change, other than having more time in China to let all of the things we learned sink in. Although we got to experience so much while we were there, it was still not nearly enough time and we could have easily stayed twice as long. But this is the plight I think we all face in 21st century…not having enough time to take the time to absorb things, to learn about different cultures and people, and to “Walk Slow.” It wasn’t by accident that we titled the film Man Zou. Just like most Americans, I have difficulty walking slow and in making this film, I forced myself to take 6 weeks out of my busy life to experience China and everything it has to offer in the hopes of understanding it just a little more. Although it was a challenge to me to break away and change my mindset, it was ultimately one of the most rewarding experiences of my life. I hope our film can serve to inspire others to do the same. Man Zou will be making it’s television debut in a few weeks on KCTS 9 and I encourage everyone to join us on our 1,000 mile bicycle trip in China. The film premieres on Thursday Dec. 2 at 10pm. Also, on Tues Nov. 30th KCTS 9, the Gardner Center for Asian Art & Ideas and the Washington State China Relations Council will be hosting an exclusive preview and Q&A about Man Zou at the Seattle Asian Art Museum on Capital Hill in Seattle. Also, if you’d like to read more about our experience, I encourage everyone to dig around our blog that we wrote while traveling in China. We posted stories and pictures nearly every day and it offers a blow by blow recount of our trip. Hope to see you all soon and remember….Man Zou! This entry was posted on Tuesday, November 16th, 2010 at 1:01 pm	and is filed under Reflections, Screenings, television. You can follow any responses to this entry through the RSS 2.0 feed. Both comments and pings are currently closed. Man Zou is a common phrase in Mandarin. It is more of a philosophy than anything. Man Zou literally translates to "Walk Slow." "Slow and steady wins the race," they say. This is at the heart of the meaning of Man Zou. Walk slowly and you won't fall. Act carefully and you won't go wrong. A slow walker is faster than someone who walks fast but always has to stop and rest. Persistence is important in learning or doing anything. "I recently underwent the most thorny, intricate, and demanding trek of my life. China is no walk in the park. The county is extremely diverse, and with diversity comes complexity. There is no smooth road laid for backpackers and attempting to do anything or get anywhere can be incredibly arduous...I really needed a break and I didn't know where I would be next. I sat down to a plate of rice noodles and peanuts. A hardy meal for a hardy man. A giant of a woman served me, but with her giant body came a giant heart. With a quick phrase that I have become accustomed to, she filled me with self-assurance that I needed for the rest of my trip. ?Man Zou!? she shouted with a big smile on her face. This literally translates to ?Walk Slow?. To me this means more then just ?be careful.? To me this means take the time to see the wonders of life. The power it gave me changed the rest of my trip. From then on everything went smoothly...I learned a lot from this Trek. I learned the beauty that exists just off the beaten track. I learned that anything amazing takes time. I learned just how much you could learn from people without even using language...By taking the time to notice all the small things in life you can really appreciate who, where, and what you are. Patience, persistence, and practice makes perfect."